"The protection of freedom of expression and media freedom requires a strong commitment to democracy, good governance and political accountability," said the European Union Ambassador to Tirana, Luigi Soreca, at the IV Annual Forum on Media Development organized yesterdayby by OSCE Presence in Tirana. The OSCE supports the proposal to adopt anti-defamation legislation, but the Ambassador Borchardt warns the government that there is a thin line between the initiative and the balance of freedom of expression. He has also demanded that punitive measures not be included in the criminal code. After the visit in Vienna, Prime Minister Edi Rama announced that the anti-defamation package will soon be deposited in the Albanian Parliament. In connection with this, the OSCE Ambassador Bernd Borchardt asked the government to take care of it, as does not follow international practices, this law can affect freedom of speech. "There is nothing wrong with something about defamation, but care must be taken. It is a thin line dividing the balance of freedom of expression. It should become the basis of best international practices. Should not be sanctioned in the Criminal Code," Borchardt said. 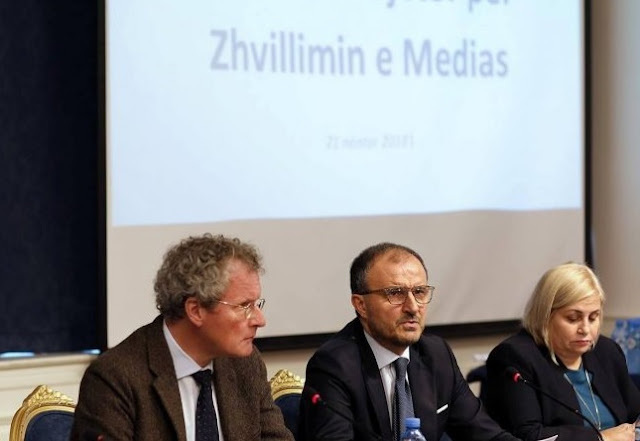 In the words of Goerge Orwell, the EU Ambassador in Tirana, Luigi Soreca has chosen to give a diplomatic message on media freedom without directly confronting the anti-espionage package proposed by Prime Minister Rama. "Press Freedom, if has any meaning, its the meaning to oppose and criticize. These are some aspects that should be well-defined in every country that wants to become part of the EU. We have supported the design of a new code of ethics and in which there is also an online media regulation aimed at an updated version of the code," Soreca said.